Hope you have had a chance to look at the last tutorial, which talks about the technology stack and creating UI HTML pages with the module and controller and Event Binding with UI elements, as well as routing in Angular JS with partial templates. Moving ahead in this article, we’ll try to understand about Watch and Digest, which play a vital role from an AngularJS perspective. 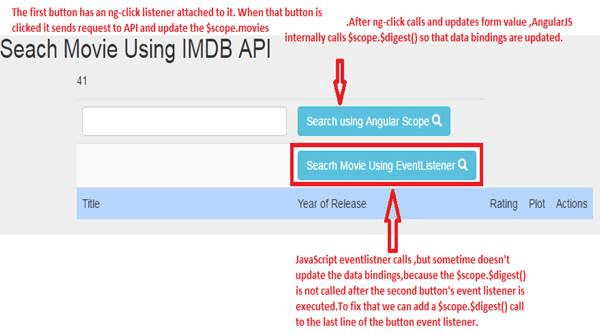 In the last article, we have seen the integration of IMDB API, which was in Angular context. Value functions -> which watches the current value of the parameter and returns. A listener function-> the listener function acts on the value that has changed and takes an adequate action to change the content of another variable or may prompt something, as per the business need. The first function is the value function and the second function is the listener function. This example value function watches the textbox ‘searchByTitle”. If the value of this variable changes, a different value will be returned and AngularJS will call the listener function. Later on the basis of the value, being the watch listener function, performs the written logic. Let see this implementation practically. “searchByTitle” is ng-model defined on SeachMovie.html page, which I’ve already shared in the last tutorials. Watch function will evaluate the change made into the input type. "searchByTitle" is shown above in the diagram. This Watch() function will be effective, as soon as you click on Search Movie, using EventListener. Kindly refer to the image, shown below. As soon as I search for any movie, using button Eventlistner and change any value in textBox, it starts reflecting the changes in Console Window. $Scope.Digest()- > As the name implies, Digest means to convert something into absorbable substances. Thus, it works in the same way in AngularJS also. If any event doesn’t appear in Digest cycle, it has to bring into Angular Digest cycle. Hope, it’ll help you some day. Enjoy coding.